After leaving my beloved town of Salento we hopped on a quick 1hr flight from the close town of Pereira to the beautiful city of Cartagena. Cartagena is a port city located on the Caribbean side of Colombia. In the centre is the walled old town which is filled with 16th century buildings, street vendors, colourful buildings and cobbled stoned streets. 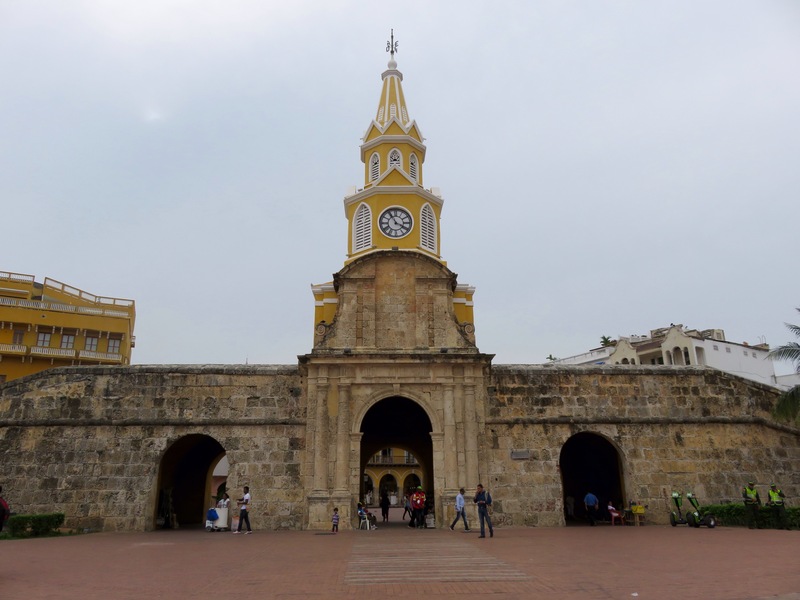 Before visiting Cartagena, I wasn’t quite sure of the reasoning behind the walled old town. 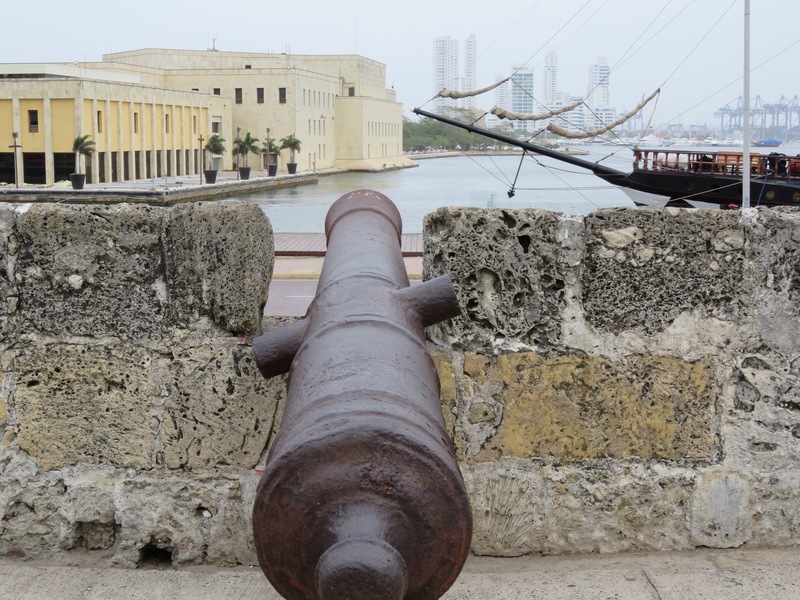 It wasn’t until I was there, that I found out that the walls of the old town were built to help protect Cartagena from pirate attacks in the early days. The walls are studded with cannons and forts that can still be seen today. In the 1980’s UNESCO declared the walled town a world herritage site. Being located in the Caribbean, it is a hot, humid city. Everyone had warned us about the humidity but I wasn’t quite prepared for the hot, wet punch in the face when I got off the plane. The humidity there is really something else. Because of this, it’s pretty uncomfortable to walk around in during the day so we did most of our adventuring in the late afternoon. 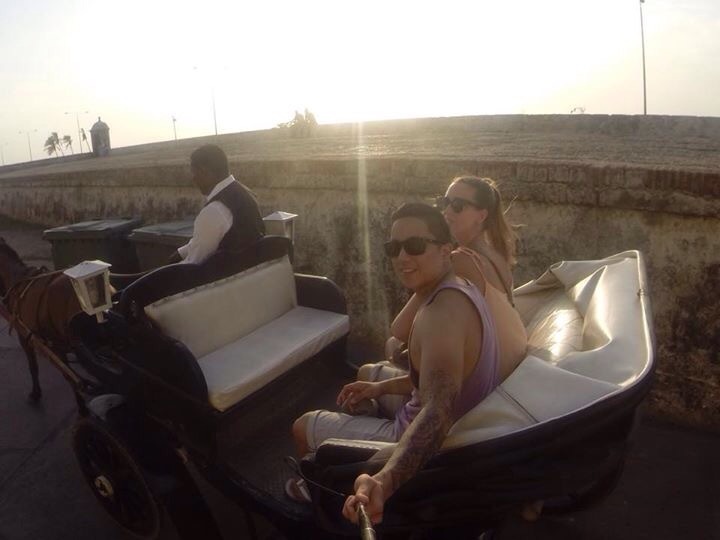 We filled our afternoons and nights, wandering around and getting lost in the walled town, eating delicious ice cream, drinking mojitos and even getting a cheeky horse and cart ride- a somewhat of a tourist trap, but a fun one none the less. We did get pressured into having a meal in a more expensive restaurant in one of the plazas. The power went out, they served us stale bread, aggressive vendor kept trying to sell us things, we waited over an hour for our meal which turned out to be very undercooked pasta that I had to physically crunch my way through. Lesson learnt- expensive doesn’t always mean better. 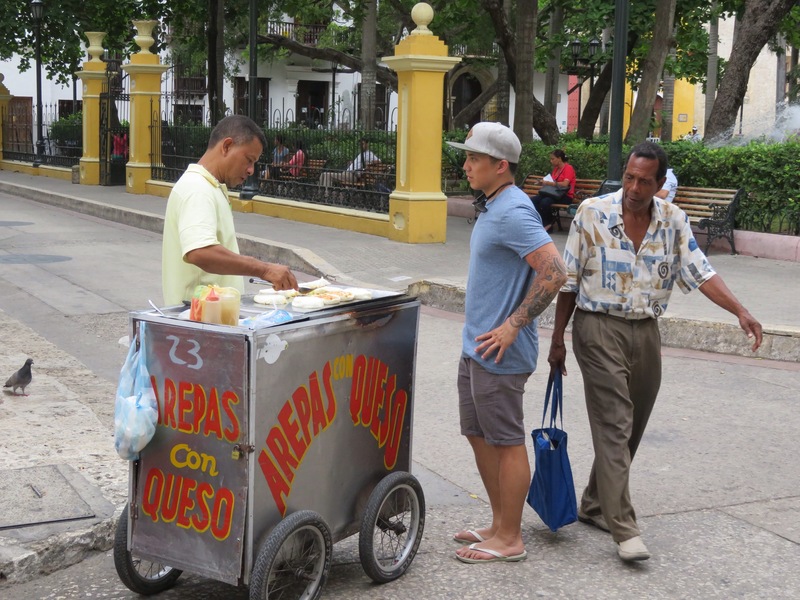 The first thing I noticed when I arrived to Cartagena, was how hard the locals tried to speak English to us (mainly because they were trying to sell us things, but none the less). This was something that we didn’t find common in the other countries we have visited in South America. The vendors on the street sell everything from fruit, arepas (a type of flat bread made from maiz dough), coffee and coconuts to jewellery, shoes, bags and soccer jerseys. Only some of them are a little aggressive, most of the time a simple “no gracias” is sufficient. So far, I think the people of Colombia have been the friendliest in South America. Castillo San Fellipe de Barajas is another popular place for tourists to visit whilst in Cartagena and it was conveniently located down the road from our hostel (mamallena). 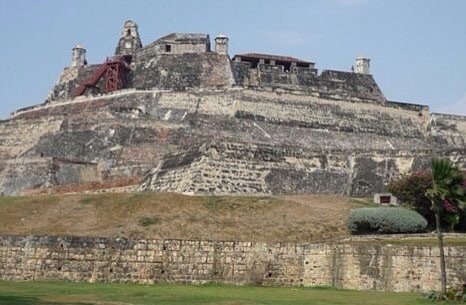 It is a huge fortress located on the hill of San Lazaro and was built in 1536. The castle was strategically placed there to dominate approaches to the city from the land or sea. In 1989, UNESCO named it a world herritage site. It’s kinda ugly to look at but it has so much history, it was a cool place to visit. 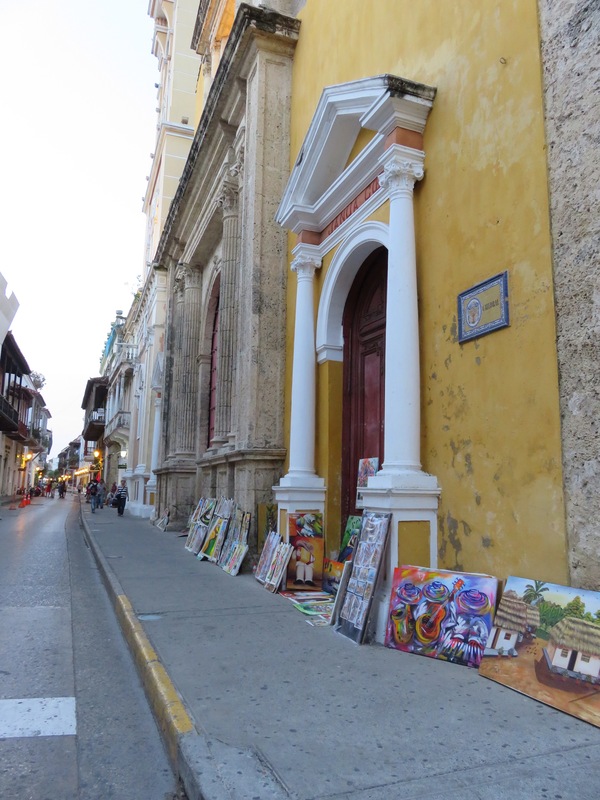 Cartagena is the most visited city in the country and it was was one of the places I was looking forward to visiting the most and it certainly delivered. It’s a beautiful, charming city filled with friendly people and plenty of history. I would go back in a heart beat.